The Hyundai Accent is a vehicle that we always sell in great quantities each manufacture year here at Hyundai of Kirkland. The reason for this is that it is an incredibly versatile and affordable option whether you are looking to buy or lease. This is a vehicle that is perfect for buyers of all ages. From the poor college student up to the working business woman who needs to commute safely to and from work each day, you can't go wrong with the Hyundai Accent. 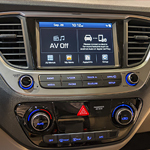 The Hyundai Accent comes equipped with all of the latest and greatest technology that is available right now. You can also upgrade your base model vehicle to include anything you could ever want. Even at its base level though, you have plenty of features to keep you not only comfortable, but safe and happy as well. Enjoy plenty of power under the hood, rear view camera, air bags throughout and power windows.